Today, it's my honor to introduce you to Kurt Frankenberg, the owner of one of my favorite blogs - ShoeString101.com. Over the past couple of years, Kurt has made it impossible for me not to love his very hands-on actionable advice he shares on his blog, as well as his tireless tenacity and desire to help. The fact that he actually implements and gets results from advice I publish at Traffic Generation Café have prompted me to ask him to write this post for you. And, between you and me, the flattery in the post didn't hurt one bit. In today’s post, I’ll show you the exact steps I took to land on page ONE of Google for a very competitive niche, using techniques gleaned from Traffic Generation Café. Just WHO IS this “Ana Hoffman” Character Anyway? A great big THANK YOU to Ana Hoffman of Traffic Generation Cafe! I get to BRAG to you today about how well her strategies have worked for me. That said… let’s just put this “Ana Hoffman” nonsense aside… as part of her inner circle of fans and readers we ALL know full well that “Ana Hoffman” is really just a code name for Angelina Jolie. Angelina Jolie, AKA Ana Hoffman’s Doppleganger. Don’t tell me you haven’t noticed. Look left, then right. Left again. Right again. Separated at birth? YOU decide. You’re really a trained assassin, aren’t you? I personally am convinced this Russian beauty queen/badass SPY is here to kick our collective tushies… but we’re all just too happy to buy into her “cover’… her side hobby as a blogger extraordinaire. Oh, and the undisputed Queen of Traffic. Letting her help us triple and quadruple the eyeballs we get on our content. But nobody is fooled. WE know the truth, uh, “Ana“. Okay, so now that I’ve blown your cover, let me introduce myself to your esteemed followers. And Who Is This ‘Kurt Frankenberg’ Character? Hiya, fellow TGC fans! Kurt Frankenberg here from Shoestring101, dedicated to helping people start on- or off-line businesses based around their hobbies and interests. Access to a thing that a certain group of people values. A way to communicate with those that value that thing! Getting this message to the masses has become my passion. I was bloggin’, bloggin’, bloggin’, keep them posts a-loggin’… and getting NO views. Well, not as many as I would like. Until I stumbled across the wisdom of Her Trafficness, that is. 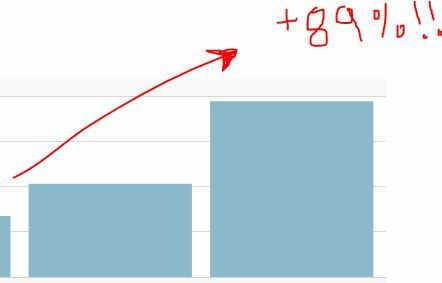 Here’s where I’ll tell you how I used TGC methods to almost double traffic to my website in 28 days. And increased traffic even more after that. And finally, how Traffic Generation Cafe techniques got li’l ol’ ME on the front-freakin-page of GOOGLE for some extremely competitive keywords! I’ve long been a fan of Ana’s style of writing. She tends to take vast amounts of subject matter, boil ’em down into USABLE, step-by step or bullet point by bullet point directives that anyone can follow. Ana’s Cheat Sheet. Click to Embiggen. They talk about doing a few “Pillar Posts”, but I have yet to see a TGC post that ISN’T pillar content. The cornerstone, “Promote Your Blog: 10 Steps to Ultimate Blog Promotion [My Personal Cheat Sheet]” was no exception. It was a blow-by-blow, get ‘er done kind of a checklist full of simple steps. That Ana says she does right after writing. So I did the list. Rather than writing new stuff, I turned to promoting and repurposing the stuff I already had “out there”. I printed out the infographic and made it my new ritual after every post. General traffic to the site enjoyed a nice pickup. After instituting this ritual and using it to promote OLD posts, I was seeing a gradual gain for several days. 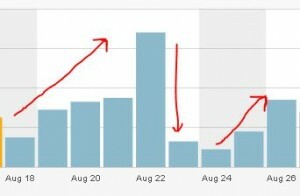 When I added a NEW post, there was an enormous bump up in traffic vs. what was normal. Even though there was a serious “down time” problem with the mom-and-pop hosting service that I had been using, and traffic all but STOPPED… that wasn’t because of the technique, it was because my pages weren’t showing. Gradual rise… BIG SPIKE as I added a single post… falloff because o’ my mom-and-pop hosting 🙁 but then it blows back up again (in a good way). Thanks Ana! After getting the problem with my hosting fixed, I looked again at the end of 4 weeks. 28 days later, even with the problems I experienced with down time on my blog, there was an 89% increase in traffic. Dang near doubled and the month wasn’t over yet! Page Views Increased 89% in 28 days Using TGC Promotional Techniques. Since then… even BETTER! Since that little experiment, traffic at Shoestring101.com has never been a problem. And yet there is still more to glean from the pages of Traffic Generation Cafe. Case in point: general promotion of Shoestring101 has been great. But promoting specific posts has especially taken off! Recently my favorite post about how to get free local business advertising from Google landed on page one, result one… no dip. As a local business owner (I own a martial arts studio and a window screen repair business which started as a 30-day challenge), it’s important to get your phone calls cheap… or better yet, FREE… from Google. I’ve discovered 7 “Ninja Hacks” and I posted how to do them on Shoestring101: 7 Ways to Hack Local Search SEO for a Free Front Page Listing. Here’s what “local” means: if you own a car wash, or a window cleaning company, or you’re an accountant… MOST of your business will come from a local geographical area. By using creative techniques, it’s possible to get on the front page of Google for local results easily and without cost. So while I do have a presence with that name… the way I get phone calls is by making a Facebook page that’s NAMED a keyword. “Karate for Kids” is a highly competitive keyword in my local business niche. Furthermore, in my town of Monument, Colorado there is a huge Tae Kwon Do chain that spends money hand over fist to try and get Pay Per Click leads for that keyword, targeted so when someone in Monument searches for “karate for kids”, they get the first listing. Guess what comes up NUMBER ONE when a person in that geographical area of Monument searches for “karate for kids”? Heh… you guessed right. IF you guessed ME that is. Result 3… is also MEEEE! Now, scrolling down you’ll come across 5 or 6 other refs to my local biz… my other hacks account for that. My ACTUAL Website, finally in fifth place. I’ve had this domain for twelve years and knocked MYSELF down four notches with these hacks! Google+ page is associated with it too. Okay so you get the idea. I’ve discovered a way to get my LOCAL business featured multiple times for specific, long-tail, deep in the buying funnel keywords… and do it for free. I pay exactly SQUAT for pay-per-click… and my closest competitor… the guy that shows up in sixth place… is SUPER well-funded and spends hundreds every month. You can totally dominate Google for local results by creating relevant content and knowing just a thing or two about keywords. Now THAT is something that the beloved Readers of my bootstrappin’ blog… mostly small to medium local business owners… NEED to KNOW. So now how do I help the business owners that need cheap local advertising to FIND and READ my Shoestring101 blog? Specifically, THIS post that will show them how to dominate page one results without spending money? How to promote this particular piece of premium pillar posting? Why of course! Back to Traffic Generation Cafe we go! So you might imagine that it could be hard to get on the front page of Google, with your strategy for gaming Google. Well, I found that it isn’t so hard as long as you’re willing to actually try out the advice of these super-gurus. 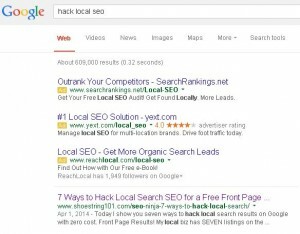 You’ll find “7 Ways to Hack Local Search SEO for a Free Front Page Listing” at or near the top of every search! Yes, I’ve used some of Ana’s checklists on blog promotion to achieve greater traffic volume in general. Views and subscriptions to Shoestring101 have never been better. But I haven’t worked all the way through the entire site… yet. Sure, I’ve READ a lot of posts. But actually taking ALL of the step-by-step checklists… the tips, tricks and techniques… and DOING them to a “T”… I’ve only just scraped the top layer of ice off the berg, yo. Only just now, for example, have I forayed into using SlideShare and PDF posting. Be Everywhere: How to Convert a Blog Post to PDF in 60 Seconds. To be honest, at first I didn’t actually think about promoting that blog post to the masses for free. I thought about making it into premium content for a membership or something…. but not without testing the market first. Believe it or not, I actually posted a gig on Fiverr saying that I could show folks how to get their local biz on Google… and made about a hundred bucks selling the PDF. Okay, so it’s in demand. But Queen Ana would be wroth. Why? Because I had only followed SOME of the directions. Yes, I made my blog post into a PDF. Sold a few of ’em too. But then completely SKIPPED where it said, halfway down the post, to use your PDF for traffic-building purposes. By posting PDFs of your material, pointing back to you, you make it easy for both the computers and the people to find you. So back to Fiverr I went, and for FIVE BUCKS… had a fella in India or somewheres post my PDF on 35 sites, including a lot of the ones Ana discusses in her “Be Everywhere” PDF Traffic tip. Wrote some content that people really wanna have. Went to Printfriendly.com as per “Be Everywhere: How to Convert a Blog Post into PDF in 60 Seconds” and saved a PDF. SOLD the PDF for a while on Fiverr, generating about a hundred bucks. Used Fiverr to post to 35 directories. Total Cost to promote my blog post worldwide and get a number one spot: $5. Except I already got paid, so actually… nothing. Less than nothing to be exact. How long it took: Well, DAYS to be honest – to write and polish the blog post. But then, yeah… ’bout 60 seconds as Ana promised is all it took to convert to PDF. Giving it to a guy on Fiverr was an investment of three more minutes and five dollah. What Happened: Insane Traffic, DUH! What else would you expect from a tip found on TGC? Results… PHENOMENAL, as in knocked everyone off page one, place one for some pretty high-competition keywords. Not a bad ROI for the additional three and a half minutes to promote that bad boy! Point #1: The first prerequisite to sharing is to have something WORTH sharing. I wrote the “Seven Hacks” post for PEOPLE. Point #2: Don’t write for robots, but understand the role they play in getting our thoughts to those that seek them. Point #3: Follow Traffic Generation Cafe tips thoroughly and without leaving anything out. Duh. Conclusion: Traffic Generation Cafe tips are not just conjecture and theory; they WORK… in the real world… for anyone that’s interested in getting more eyeballs on their content. Who knows how long my hack for getting your local biz on the front page of Google results will last? Before you know it, “Big G” may change the rules. Also, who knows how long this awesome blog post-to-PDF-to top of the GLOBAL search results will work? Uncertain as well… but you can be sure of one thing: when the rules change, those that are tuned in to TGC will know about it first. And more importantly, what to do about it. And for letting me come here and post the results I got, just for following your step-by-steps. I’m so sorry about blowing your cover as a “content marketing expert and coach”, when really you are an elite intelligence operative. I suppose it would be BAD to tell everybody you’re in your lab… cooking up a top-secret evil military grade Content Generation, Promotion, Conversion, and Repurposing System beyond anything imaginable? I certainly will NOT tell them it’s full of stupid-simple checklists, effective posting schedules, sneaky ways to find out EXACTLY what your target audience is craving, or nuclear-powered content generation and repurposing strategies. NOOooo, wouldn’t even think of leaking that information. Measure the impact it has on YOUR biz and bring it back to this page. I know Ana loves to hear comments from the faithful… but how ’bout this? …INSTEAD, tell her what her advice really did for YOU. Post in the comments below, “OKAY, I WILL take Kurt’s TGC challenge” … IF you are ready to commit to testing one TGC strategy and coming back to this page again with the results. There’s a wealth of wealth of wealth of information on TGC, and depending on where you are in your Content Marketing journey you should pick one that’s appropriate to YOU. Just choose one, and see how it does for you. Kurt Frankenberg’s mission is to help everyone with a dream to become their own boss. He is the founder of Shoestring101.com, where he teaches the principles that enabled him to start three very different kinds of businesses starting with zero capital. Looking to start your own business, but don’t want to risk your savings or take out a loan? Check out his book ‘Get Paid Today! Structure Your Startup to be Profitable from Day ONE’ on Amazon. Great seo tips. I think I like that of local seo and repurposing old posts. I will try to implement it in my blogging career. Thanks a lot. You are very welcome, Emma; thanks for coming by. Thanks Ana and Kurt, for sharing such an informative post and actionable tips. Ana, I love reading your blog, always helped me in learning something new and getting new ideas. So glad to hear it; thanks for coming by! Also, for anyone looking into guest posting, this is a great example. Your post is well aligned to Ana’s work and her audience, written in a similar style and format to her posts, and makes her look like the star she is. 3 for 1 – Nice! You brought a smile to my face, Chad – yes, Kurt is a celebrity in Ana Hoffman’s world.  And welcome to Traffic Generation Café! Awww you both are so kind. Chad, it’s been a pleasure to help you with the web copy for your site… still working and WILL be finished soon… but, hey. It wasn’t bad to begin with. You gave me great raw material. It just makes sense to have a second set of eyes on what you’re trying to say. Ana has told me that I NEED a good editor… she’s seen where I fall flat on MY face writing copy for myself. She is good at giving critiques… no punches pulled but that’s what we need. To put our best foot forward for the audiences we serve. As far as getting ranked, or getting found by just the right people you are writing for… keep doing what you are doing: writing for PEOPLE, not robots. Your Product Innovation ideas and PDMA test prep materials are industry standard stuff. Now, Ana’s tips will help you PROMOTE… but never lose that edge that you –>already<– have: amazing content for exactly the people that need it. Hold that banner HIGH, baby! Stay pure, stay focused on serving your customer. Then come here to find out to help more of your target customers find you. The Queen of Traffic will not steer you wrong. It takes time, a lot of planning and hard work to get to number one position. No matter it is about blogging or company website. I doubt that there are any shortcuts and backdoors. But you do have to have strategies in place, Carl, and this is one of them. Right Carl, no one’s saying that it’s easy. But there are certain steps to take and certain actions to avoid or skip. I’m very thankful that these steps on Traffic Generation Cafe are available to ANYone that’s willing to put them to work, without the benefit of extensive technical knowledge. Traffic Generation Cafe has given me the ammo I need to get MY message where it’ll be seen. No shortcuts, but simple, doable steps for those that don’t mind a little work. Great case study Kurt! I definitely agree that having great content that’s worth sharing is definitely the first step! I recently got a 100% link from a high-authority blog without my asking. it was VERY cool. That’s always a great bonus for writing great content! I think that Google will ALWAYS be revamping their algorithm(s) to confound the black hats, and sometimes take out us whitehats as well with their updates. But the one thing Google will probably ALWAYS do is endeavor to serve up what’s most relevant to those doing the searching. For that reason I write to people, not robots. I’m NO SEO expert; Ana will tell you that I’m EXTREMELY tech-challenged… but at least one thing I wrote got a little attention. SOund like you did too and good for you! Now we both need to go back to our drawing boards, churn out even more great content… and follow the down-to-Earth simple tips from TGC. At least, that’s the plan for this kid. Thanks for the comment Joshua! Where may I find your post? Sounds good in theory; however, without promotion, even the best content is as good as dead. You’re BOTH right! One hand washes the other. Great promotion, so-so content… blah. Like a blind date that turns out bad. SO great content, great promotion… now we’ve got something worth crowing about. You’re on the right track with the content production Madhusuhan! Now run it through Ana’s Trafficology checklists and you’ll get it SEEN. That’s *WINKING* at a pretty girl in the dark. Typo in the middle of a cute joke… sorry guys. But you get the point right? You need to get their attention, THEN impress ’em further. I enjoyed reading your post a lot, i appreciate your efforts that has yielded this uncommon results. keep it up. Thanks, Oghale; glad you enjoyed Kurt Frankenberg’s post. And Happy New Year to you as well! Kurt, this was terrific I mean as terrific as a oscar drama. And Our Ana you know she is the Oscar’s Fave Babe, the Traffic queen. She would have been a Greek queen, if she were born 5000 years ago though. I had read Ana’s tips on converting to PDF then I did not get something (my fault) as it may be seen as duplicate content by Google as the content is already on my blog. So I was hesitant. Now I have the confidence of following you. Until recent times I have been tracking and following and spying (No don’t call the FBI, I am just using these words to do justice for the love I have for her posts)Ana madam so very much that I had reach Entrepreneur-journey where she had written a couple of posts some years ago. And guess what, I know you would concur my words – “She had actionable tips then too”. You only need some time, a well written post like yours and Ana’s site opened in one tab. That’s the secret recipe for success. Well written guest post Kurt. I am hopping to your site now to find some chunks to guld and satiate my blogger-inside. Thanks so much for stopping by, Swadhin, and sorry it took me a while to get to your comment; certainly wasn’t because I didn’t appreciate it! I think people worry too much about duplicate content (which, by the way, doesn’t really exist the way people think of it – duplicate content is content that resides in multiple pages on your site; I wrote a bit more about it here: https://trafficgenerationcafe.com/duplicate-content/). Thats definitely not an issue. Thanks for approving it. Thats the first time I had wrote humor about someone I respect and I am glad you appreciated it. On the duplicate content issue: thanks for the link I am checking it out now and I think it will clear my doubts. Life without humor just isn’t as much fun in my books… Have a great weekend, Swadhin! I really like you blog posts because of the actionable tips and techniques you share. Thanks. You are very welcome, Angelina; thanks for coming by! THANKS Angelina! Ana’s tips and tricks have made an enormous impact on my blog, and her personal touch has made me to fell like I can do this too. I’d love to issue a friendly challenge to you; pick one of the links at the bottom of this post and try the techniques for a month. I think you’ll be exquisitely impressed. These tips are worth their weight in gold and more… but ya gotta use ’em. Let me know if you’re up for the challenge! I like this article and I even checked out Kurt’s blog as a result of reading it. I really like the infographic. Saw your comment on SS101, thanks George! Glad ya liked it. Yes, it’s nothing short of AMAZING, the lift my blog has gotten from Ana’s techniques. Unexpected but totally awesome side benefit: making likeminded friends! I’ll be to visit successharbor.com soon and drop my $.02 as well. Thanks for the feedback…. Wanna take the Challenge? Did Kurt write something about SEO? Fun post Kurt! Never hurts to add flair to a search engine themed post. Really, I dug your 2 step process to start it all. Be all about finding something valuable to offer them and communicate with them. Prime the SEO pump by getting serious about following the 2 steps. As for the tips, the more diligence I display in this area the easier it becomes to drive targeted traffic. It’s a simple gig, really, if you’re patient and if you’re willing to follow a few basic steps. Guys, super post with a WONDERFUL format! Albert EInstein once observed that committing 15 minutes per day to reading on a subject that interests you computes to 90 hours… like a COLLEGE COURSE… in one year. Likewise, committing 15 minutes per day to promoting your content equates to BEEEEG returns over the long haul. Okay, here and now I’ll say what which of the posts I’m going to do, starting December 15: it’s the “Content Marketing Leverage System: How to Multiply Your Reach” post. 25 minutes per day, upcycling old content into other stuff. I’ll report back to you, all the readers here, and Ana with my results. Likewise, I wanna hear YOUR report young man! Let’s put that diligence to the test baby. I know you’ll be pleased with the results. NOT gonna comment on that one. Well… guess I just did. lol… this comes from Brittany Bullen’s post (http://www.mommybloggeracademy.com/steal-these-blog-layout-tricks-from-the-pros/) where she said we can ‘steal’ design ideas from other bloggers and gave shirtless Ryan Biddulph as an example of how to stand out by being different. Haha she IS purty Ryan. But being a happily married man, MY interest in Angelina, er, ANA is her ability to revolutionize a content marketer’s output over 100%, just by adding 5% more effort in the right things. Great insights for local SEO, and that really is the important one since most businesses are local and they don’t understand how to get themselves positioned on Google well. I was just literally chatting with a friend who is a local business owner and I shared the article with him. I know he will glean some information that will be very useful to him in the article. Ana, I haven’t had a chance to go through your site much lately but I love the links and the titles and will be doing so over the next few days. I hope you guys have a great second half of the week! Please tell your friend that I am available to him (or her) for free advice on how to best apply those local SEO hacks. All I ask is that I can write the success story afterwards! Ah just looked back. Him. Okay, tell your friend I’ll help him with his biz, no strings attached but the writing after, which will give him more free exposure. As for YOU, young man..! I CHALLENGE you… double dog DARE you to choose one of those posts at the bottom of the page… apply it for a month… and report back here with your results. Coudja use more traffic? Well, COUDJA? 😉 If so, take some action and I guarantee you’ll be happy that you did. There’s your daily dose of kick@$$ encouragment Don. Wishing you an excellent second half as well. That is soooo true. I do see the similarities. Kudos for solving that mystery, Kurt. My gosh, I referred to that post ALL the time about a month or so ago, but then stopped because I was going through some family issues. I have to follow your lead and actually download it and tape it up so I can follow it step by step. Because when I did follow it, I was getting traffic out the wazoo. I accept your challenge, Kurt. I already love Ana’s work and now I just have to actually do it. So I will start applying all those techniques in those blog posts, because each of them are awesome, and then will let Ana know how much she’s appreciated. Thanks for this inspirational guest post here. Woooo Hooo! Another Challenge Accepted! …these TGC tips will blow your socks clean off. I know because I’m still experiencing jaw-dropping results. Know this: I wouldn’t DARE ask anyone on this page to do anything I’m unwilling to do as well… so guess what? I’m ALSO choosing one of the tips on the list at the bottom of the post and using it for 30 days. I’ll report my progress to you then, here in the comments or in greater detail if Ana thinks it warrants another guest post. Thanks, Nick – and thank to Kurt for writing the post! Thanks Nick for the kudos and thank you Ana for the opportunity to share. Your tips, tricks, hacks and PRINCIPLES have helped many a struggling blogger. Nick, come on back soon as you can! I’d love to know which of the TGC posts helps you the most. Kurt actionable tips you shared, will definitely bookmark this post. I will take the Kurt TGC and let me see the result. Yayy Peter Kanayo! We’ve had a number of Ana’s Google+ followers say they’ll take the challenge, but you’re the first to take it in the comments section here. I look forward to your report. Which of the techniques are you going to try first? There’s a list of seven good ones at the bottom of this post. Best wishes to you (I never say “good luck” because I don’t believe in it) and I hope you get even better results than I have! Glad to see you here man. I love Ana’s hacks and yours as well. I truly believe that everything will work as long as you really put your heart and soul into it. I don’t mean try it for a day or two. Give it a month or two and watch it grow. Tweak from time to time to get it work the way YOU want. Top notch weiting and even pocket-ed this for future reference. Reginald! Glad to see you here as well. Yup, Reginald… a clear idea of what you want as an outcome and the willingness to test and tweak as you go is the success plan for JUST ABOUT everything. Glad to hear you bookmarked this one to come back to. I’m gonna suggest that you take Ana and me up on our challenge: pick a TGC post, follow directions, and track results. I can almost guaran-dang-TEE ya that you’ll have more traffic as a result! Thanks for your comment Reginald. I’ll see you on your blog again this week. Wow. Just… wow. This is amazing. Can I say I’m surprised at those awesome results? Not really. Ana knows what she’s talking about. And Kurt, your hacks for local SEO are really brilliant. I might have to just take a stab at some of that stuff. I clicked over to the “Be Everywhere” post because I don’t think I’ve read that one yet. Looking forward to learning more! You guys are so smart. Man, I have to confess every time I visit this site I feel like I need to add an extra three hours to my work day so I can start implementing what I learn! Either that or figure out a way to be more efficient, I suppose… but we do what we can. Dunno if I’m all that brilliant… just dumb enough to actually follow directions once in a while! Most of the local SEO hacks were just spinoffs and expansions of a tip I learned with from James Wedmore. 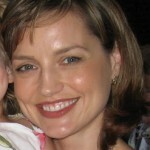 And obviously everything I’ve done right with promoting my blog has come from Kristi Hines and Ana Hoffman… MOSTLY Ana. SOOoooo… thanks for your comment Brittany. I do appreciate it. Please do let me know how these hacks work for YOU. Come back here and post again, I’d love to know how your biz has grown and what other lessons you have learned! AHEM. (speaking to Readers of TGC) Look, dude. Or dudette. Whatever. Grab ONE of those seven links just above my bio and actually DO the DIRECTIONS that Ana has shared with you, and track your results. I say this not for my benefit or even for Ana’s, but for YOU. Whatever you need… more traffic, more engagement, better indexing, more dollahs from conversions, what? Whaddya need that you don’t have? TGC tips deliver, hands down. I for one can’t wait to see Ana’s premium content. But “can’t wait” means just that — DON’T wait. Use the free stuff now and see if you don’t move the needle dramatically in your own content marketing efforts. Whew. Okay, go that off my chest. Remember, in your comment write “OKAY, I WILL take Kurt’s Challenge”…and actually follow TGC directions to a ‘T’. Then come back in a month and post your results. I can tell you are paving the way for more guest posts at TGC, Kurt (aka buttering me up but good, lol). Loved the post, loved the results, loved the challenge, loved the buttering up!